In this episode, tool use in not-avian dinosaurs, tetrapods riding tetrapods, and Darren and John give career advice* (yes, really). Then, discussion of Star Wars VII, the first film since the abysmal Lucy John rates higher than Darren. February 22, 2016 by John Conway. In this very special episode of the The Tetrapood Zoology Procarts, big cat books, plesiosaur papers, and Cash for Questions! on Amargasaurus spines, and speculation on the replacements for amphibians. Also, discussion of Star Wars the original series, and a bit of prequel bashing, before moving on to the SPECIAL EVENT. January 28, 2016 by John Conway. In this episode, Darren and John get progressively less serious. Starting White Nose Syndrome in bats and the history of such events, giant herbivores of the Permian, and tool use in snakes, discussion concludes with a chaotic rundown of the merits of Jurassic Hunters AKA Cowboys vs Dinosaurs. Conclusion: better than Jurassic World. December 18, 2015 by John Conway. In this much delayed episode, the value of hybridisation in conservation, the proportions of large pterosaurs, evolving flight from gliding animals, and our choice of the best fossil taxon to find with soft tissue preservation. December 10, 2015 by John Conway. In this episode, many Cash for Questions! : the advantage of sabre teeth, our favourite speculative worlds, the latest fads among deer, flightless pterosaurs and Dong Tao chicken feet. October 8, 2015 by John Conway. In this question-tastic episode, Darren and John are back with amphibians (or lissamphibians? ), the birthing habits of metriorhynchids, melanosomes in birdy dinosaurs, sperm whales, and small dinosaurs (or lack thereof). September 14, 2015 by John Conway. In this extinction-filled episode, Nanotyrannus, Schmanotyrannus, the frog problem, the survival of non-avian dinosaurs past the M/C extinction time, and Darren and John's dinosaur movies plots. 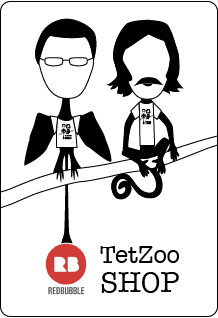 Also, TetZooCon 2015 - get your tickets here. July 22, 2015 by John Conway. John and Darren discuss Jurassic World. Spoilers! It's no good. June 19, 2015 by John Conway. In this late episode, Darren and John discuss the Romanian find of century, dinosaur premaxillary genetics, and Yee chee, or Yee kwee, or something. Also, Cash for Questions! : is Canine Transmissible Venereal Tumour a tetrapod? and Africa as a Pleistocene remnant. June 3, 2015 by John Conway. In this crazy mixed up episode Darren leaves out all the juicy bits from his trip to Romania, pterosaurs landing, domesticated horses in sub-saharan Africa, and the evolution of beaks in dinosaurs. Also the return of Brontosaurus, and the return of paraphyletic taxonomy. Trailers are discussed by Darren, scoffed at by John. May 6, 2015 by John Conway. Brace yourselves listeners, as we MOVE THE SEGMENTS AROUND. First up is Cash for Questions! with the gait of synapsids, the homology of scales, and Myotragus and the giant Minorcan lagomorphs. News From World of Darren & John includes the new short-necked azhdarchid and News From World of News include a new tapir, a (not new) albino tapir, theropod neoflightlessness from Feduccia & Czerkas, and Carnufex. March 26, 2015 by John Conway. It’s the big four-oh, and FU is a complete mess: Red Letter Media guy, Rio 2, How Big is Texas (bigger or smaller than France ! ), Spotted owlet. News from World of Darren & John includes the news from The Scholarly Research of the Anomalous Conference, and John's new Twitter handle (@thejohnconway). News from World of News includes, Eotaria, Purussaurus bite strength, diverse docodonts, BD in Madagascar, and the the passing of Stephen Czerkas, Vladimir Krb, Eugenie Clark, and Leonard Nimoy. Cash for Questions! include aquatic sloths, the musical ability of tetrapods, and how to respond to cranks (with a nice little excursion into x-came-first hypotheses). Darren and John now both have Patreon rewards that include free Cash for Questions! Support Darren here, and John here. March 4, 2015 by John Conway. In this not to shabby episode, FU on Planet of the Apes, Darren talks to school kids, Scholarly Research of the Anomalous Conference, FROGS, Tet Zoo 9th birthday. News from world of news is Darren's take on Conquest of the Skies David Attenborough series (not too shabby). Cash for Questions! include why archosaur replaced synapsids in the Triassic, what the adaptive advantage is of being able to regenerate limbs, and Darren's opinion on the film Rio (terrible). January 22, 2015 by John Conway. In this Best Dinosaur episode, FU includes cassowaries, ‘Labrodon’, liberal Hollywood, and gull feet. News from Darren & John includes Darren the cruisemeister, Big Book, what’s at Tet Zoo, FROGS, Tet Zoo's birthday, and no news from John. News from World of News whips by with the two minute rule in effect, with Rue Pei et al. new Microraptor, bird phylogeny papers, Koschowitz et al. vs Mayr on feathers, Aquilops, dwarf elephant, no polar bear in yeti DNA. Cash for questions include what the best dinosaur is, the social structure of dinosaurian groups, and the rights and wrongs of keeping whales and reptiles in captivity. January 9, 2015 by John Conway. In this time-dilated episode, FU on hyenas, new in cassowaries, seals vs porpoises, Alanqa jaws, and giant Chinese nothosaurs. Cash for Questions! include the fossil bias of unusual specimens, and why gulls stare at their feet. Our Popular Tat section is on Jurassic World, and Interstellar; and in a shock outcome, Darren rates it lower than John. December 4, 2014 by John Conway. In this shockingly normal-length episode, we have more FU on freediving, how to Patreonise Darren, Archelosauria, Vintana the gondwanathere, and Cartorhynchus. Our C4Q this episode is about the possible switcheroo of hyenas and dogs in their cursorial and borophagian ways. Also fairy tales, including a discussion on Maleficent. All wrapped up with an anecdote from Uncle Darren. Yay. November 19, 2014 by John Conway. Episode 34: What the Hell? In this thrilling and unbelievably long episode, FU dumbass Darren! Lungs & diving, Star Wars screwup again, re-wilding & ecotourism, and a plethora of other things Darren got wrong. News from World of Darren & John includes the Shanklin croc, multituberculates, and the Tet Zoo wiki. Cash for Questions! include "what the hell is going on over there? ", and what the deal is with sail-backed animals. November 11, 2014 by John Conway. John and Darren launch into followup, which is mostly about how big legs are or aren't. News of the world of Darren and John and also News include our palaeoart article, Darren’s lament, kangaroos that didn't hop or did, podcats reviewed at Li’L Box Big Universe, and the Chickensaurus Event (#chickensaurus). Cash for Questions include our options on rewilding, and why mammals ain't got no no legs. Stay tuned at the end for a special treat: Uncle Darren's Anecdotes, a new segment of Uncle Darren's witty and charming stories that are sure to delight you and the whole family. October 21, 2014 by John Conway. So, I'm uploading this from an internet cafe in Malta, so I can't listen, and I can't for the life of me remember what's in this episode. Safe bet: some dinosaurs, pterosaurs, Cash for Questions! and some terrible movie. Am I close? September 27, 2014 by John Conway.